This is an amazingly variable species of Pholiota, characterized by its mottled purple to olive or yellow colors, the veil remnants that usually persist on the cap (at least along the margin) and stem, and microscopic features. 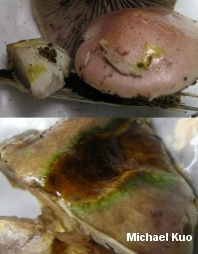 It also has a distinctive green reaction to KOH, but the color change can take up to 30 minutes to develop. Pholiota polychroa decomposes the wood of hardwoods, east of the Great Plains. 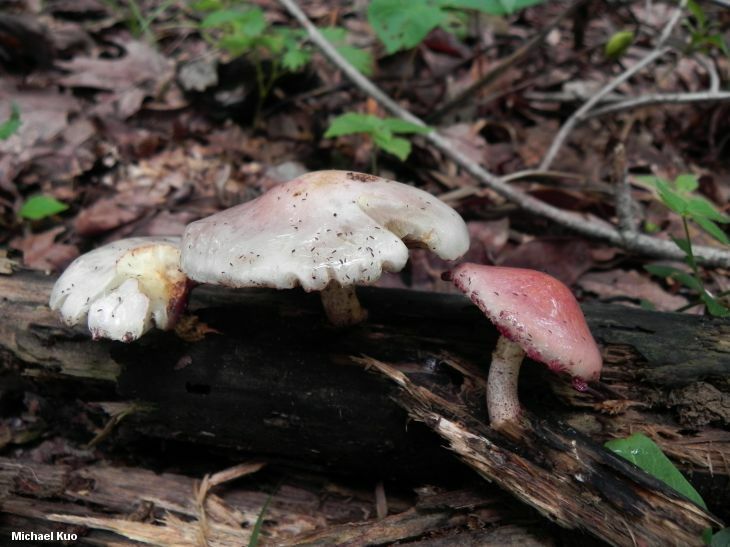 Ecology: Saprobic; growing alone or gregariously on the deadwood of hardwoods (rarely on conifer wood); summer and fall; widely distributed east of the Great plains, but apparently a little more common in the southeastern United States. 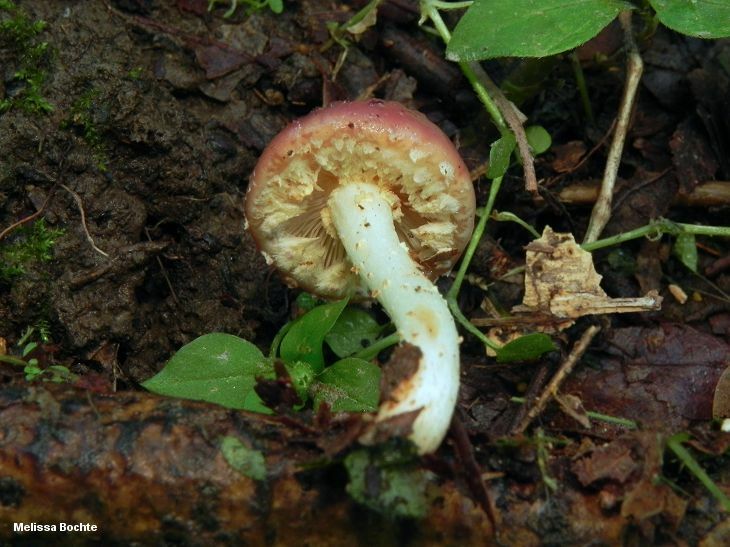 Cap: 2-10 cm; convex, becoming broadly convex, broadly bell-shaped, or nearly flat; sticky or slimy; cuticle peeling with ease; variable in color but usually mottled with shades of olive and pinkish purple (sometimes almost completely one or the other color) when young, developing yellowish to orangish areas with maturity; at first with scattered veil remnants but often soon bald overall; the margin usually hung with veil remnants. 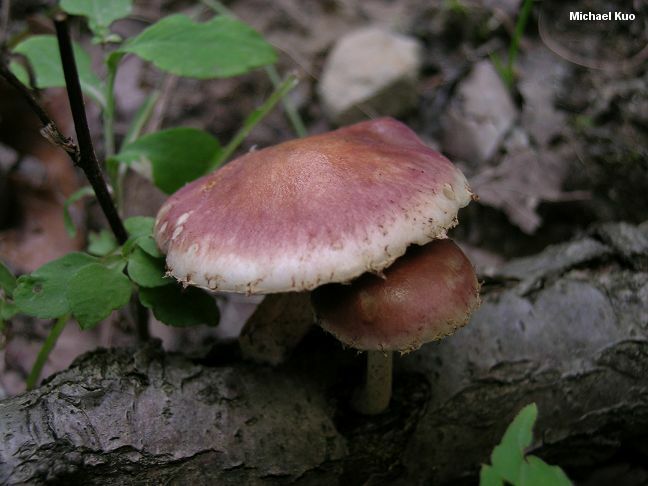 Gills: Attached to the stem, often by means of a notch; close or crowded; whitish to yellowish or slightly purplish when young, becoming grayish brown to purplish brown; at first covered by a partial veil. 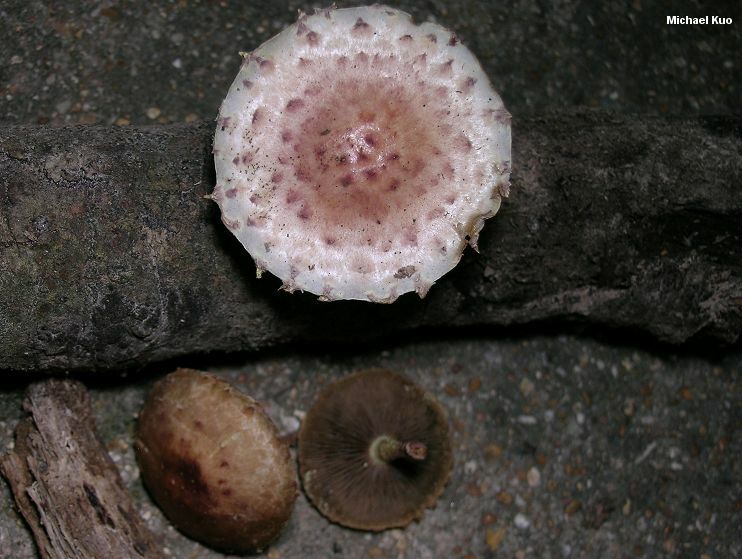 Stem: 2-6 cm long; up to 1 cm thick; dry, or sticky near the base; silky near the apex, but often covered with scales or veil patches below; with a flimsy ring or ring zone; usually yellow to yellowish, but sometimes whitish, bluish, greenish, or brownish. Flesh: Whitish to yellow or greenish. Chemical Reactions: KOH greenish yellow to green on cap (sometimes taking as much as 30 minutes to develop); iron salts slowly deep green on cap. Spore Print: Brown to dark brown or slightly purplish brown. 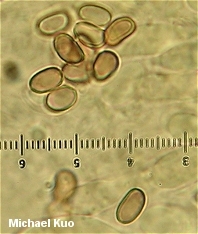 Microscopic Features: Spores 5.5-7.5 x 3.5-4.5 µm; smooth; ellipsoid; with a pore. Pleurocystidia fusoid-ventricose. Pileipellis an ixocutis. Clamp connections present. REFERENCES: (Berkeley, 1847) A. H. Smith & H. J. Brodie, 1935. (Smith & Hesler, 1968; Smith, Smith & Weber, 1979; Weber & Smith, 1985.) Herb. Kuo 06261101, 09291102.